The Great Minquas' Path (or The Great Trail) was a 17th-century trade route that ran through modern day West Chester, PA. The trail sign can be found at the intersection of Route 322, Route 100 and Route 202. The Pennsylvania Historical marker reads, "From the Susquehanna to the Schuylkill. Crossed the present road about this point. 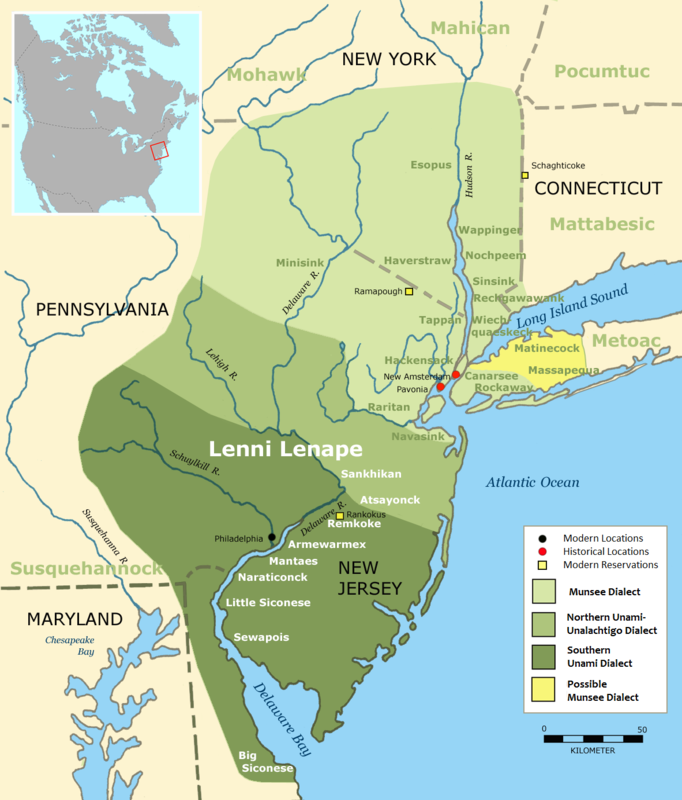 It was the path prior to 1670 for their [Minquas] conquest of the Lenni-Lenape or Delaware Indians and for trade with the first Dutch and Swedish settlers on the Delaware River." In the 1600's, the trade route ran through southeastern Pennsylvania from the Susquehanna River near Conestoga to the Schuylkill River adjoining Philadelphia. The 80-mile trail runs east-west and was the primary route for fur trading with the Minquas (also known as the Susquehannock). "The Dutch began the fur trade in the 1620s, and named the trail "Beversreede" or "Beaver Road." Sometime after 1633, they built Fort Beversreede at the trail's eastern terminus, the confluence of the Schuylkill River and the Delaware River. A 1655 Swedish map shows the fort on Providence Island, on the west bank of the Schuylkill at its mouth, although Scharf & Westcott state that the fort was on the east bank. 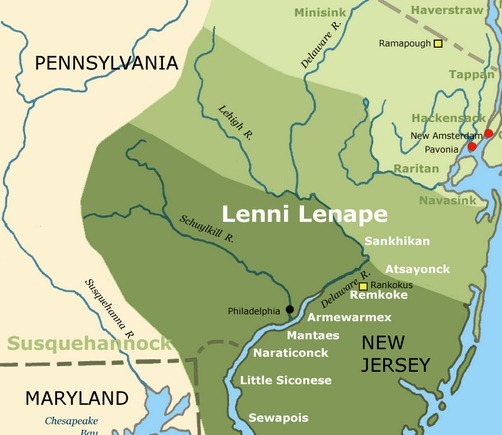 In 1634, the Susquehannock used the Great Minquas Path in their conquest of the Lenni-Lenape (or Delaware) people. "Minquas," meaning "treacherous," was the Lenni-Lenape name for the Susquehannock, their traditional enemy. The name was adopted by the Dutch, and later the Swedes. The Swedish colony, New Sweden, was founded in 1638, about 20 miles (32.5 km) south of Fort Beversreede, in what is now Wilmington, Delaware. In 1644, Governor Johan Bj鰎nsson Printz built Fort Nya Vasa where the Great Minquas Path crossed Cobbs Creek. This attempt to siphon off Native American trade from the Dutch was unsuccessful. Printz tried again at Fort Beversreede itself. In 1648, the Swedes built a blockhouse directly in front of the Dutch fort, rendering it useless for defense. The Dutch abandoned the fort in 1651. Under Peter Stuyvesant, the Dutch returned and conquered "New Sweden" in 1655, renaming the colony "New Netherlands." The English in turn conquered the Dutch in 1664, and the tiny colony became part of the 1681 land grant to William Penn. The English called the Susquehannock "Conestogas," after their main settlement on the Susquehanna River. The Susquehannock were decimated by smallpox, and by long conflicts with European settlers in the Chesapeake Bay region, 1642�, and the Iroquois to the north, 1658�. Many of them moved or intermarried with other tribes. A century later, in December 1763, the Paxton Boys massacred 20 of the Conestogas, and the tribe soon became extinct in Pennsylvania.